This "Historically Speaking" column appeared in the Exeter News-Letter on Friday, October 27, 2011. “On the brink of the hill stood a little white schoolhouse, much wind-blown and weather-beaten…” wrote Sarah Orne Jewett. 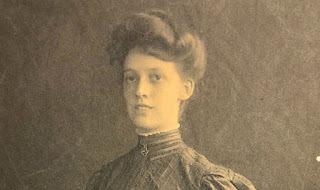 During the early part of the twentieth century, Jewett was an accomplished author – writing primarily about nature and life in small town New England. Although she wasn’t born in Exeter and never lived here, she had strong ties to the town through her ancestry and often visited for long periods. Born in South Berwick, Maine, in 1849, Jewett was a doctor’s daughter. Her father, Theodore Jewett, had studied medicine at Harvard and completed his practical studies in Exeter under the capable guidance of Dr. William Perry. While in Exeter, Jewett had met and married Perry’s daughter, Caroline Gilman Perry. Once his studies were complete, Dr. Jewett returned to his family’s hometown of South Berwick. Sarah was a sickly child, suffering from rheumatoid arthritis, and was often absent from school. The nature of the disease caused acute flare-ups that would primarily affect her knees and shoulders. Once the swelling went down – and she sometimes reported that her knees would swell so badly that she couldn’t see her feet – the pain would linger for days or weeks. It might seem that this would lead her to be a bookish girl with endless hours spent on a couch reading, but for Sarah it was just the opposite. Classrooms were like prisons for her and only increased her discomfort. She preferred wandering the woods and fields of her village to sitting still at a desk. Arthritis is sneaky that way – it can make one immobile for stretches of time, yet it is best treated with movement. Children today, even with much better treatment, concur that sitting in school all day only makes things worse. Luckily for Sarah, her father indulged her self-treatment and allowed her to skip school. He took her on his calls around town and she got to know village life in depth. She also visited her grandparents and cousins in Exeter very frequently. During the summer of 1857, she stayed in Exeter at her grandparents’ house on the town square to attend the summer term of school. Old Doctor Perry proved to be just as adept as his son-in-law at treating the girl with care. She was probably lucky that both her father and grandfather ignored the common treatments of the day and felt that fresh air and sunshine were the best treatments for her aching body. Dr. Perry’s medical text (currently in the collections of the Exeter Historical Society) - “First Lines of the Practice of Physic” by Dr. William Cullen, published in 1807- advocated topical bleeding, purging and a bland vegetarian diet for the treatment of chronic rheumatism. Her father undertook to educate his daughter primarily at home after her reluctance to attend school was identified. She wrote later, “in these days I was given to long, childish illnesses, and it must be honestly confessed, to instant drooping if ever I were shut up in school. I had apparently not the slightest desire for learning, but my father was always ready to let me be his companion in long drives about the country.” She may not have liked to read or study, but she did adore taking in the sights and the characters they encountered on their travels. “I used to linger about the busy country stores, and listen to the graphic country talk. I heard the greetings of old friends, and their minute details of neighborhood affairs,” she wrote. Her life was filled with the people of New England and her later writings would include dialogue that would read just as it sounded to her young ears. At the age of 19 she began sending stories to magazines such as Atlantic Monthly and quickly made a name for herself. Although she suffered from arthritis flare-ups for the remainder of her life, she never allowed it to control her ambitions. She traveled the world, but always returned to South Berwick. Her serialized stories were published in book format, the most well-known include A Country Doctor, published in 1884, and The Country of the Pointed Firs, published in 1896. In an undated letter, she wrote to the librarian of the Exeter Public Library, “I do not forget that I am a grandchild of the old town and of the Gilmans who always have had its well being so close to their hearts. 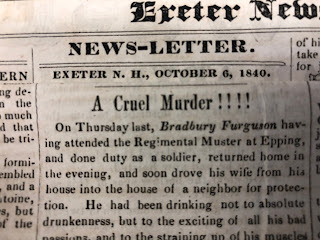 Believe me.” She may be associated with South Berwick, but Exeter was dear to her.